Today’s IT buyers are different than those of just a few short years ago. They know what they want. They understand their own pain points, and they’ve spent time studying your solutions, and those of your competitors. In fact, Gartner’s CEB says your typical buyer is 57 percent of the way through the buying process before ever speaking to one of your reps. So, when prospects connect with you, they’re typically ready to see and trial your product. Even the slickest and most beautiful PowerPoints and video clips won’t cut it anymore. Buyers are tired and skeptical of over-promised features and capabilities. They want to see your product as is, and then they can listen to your roadmap. Prospects also know that an intuitive user interface can make the difference between success at their organization or not. Let’s say your team passed the first stage and the prospect was excited about what they saw. Now they want to try it hands-on before making a commitment. They want to test it with their other systems. Are you really going to slow the entire process down by shipping hardware and asking their local IT resources to open firewalls and reconfigure systems? Just that entire experience can put a bad taste in a prospect’s mouth before a POC even begins. It’s not scalable. If your sales team has to dedicate extensive resources to each demo in order to meet modern customer expectations, the number of prospects you can touch is limited. It requires local IT involvement. The need to open firewalls or change other system configurations to support demos taxes your prospect, as well. This is not an ideal way to start or nurture a relationship. It’s difficult to keep sales engineers aligned. While you need to customize demos based on prospect environments and needs, you also want your SEs using the most updated demos. Syncing updates is more challenging with outdated demo practices. Your prospects can’t trial your solution on their own. 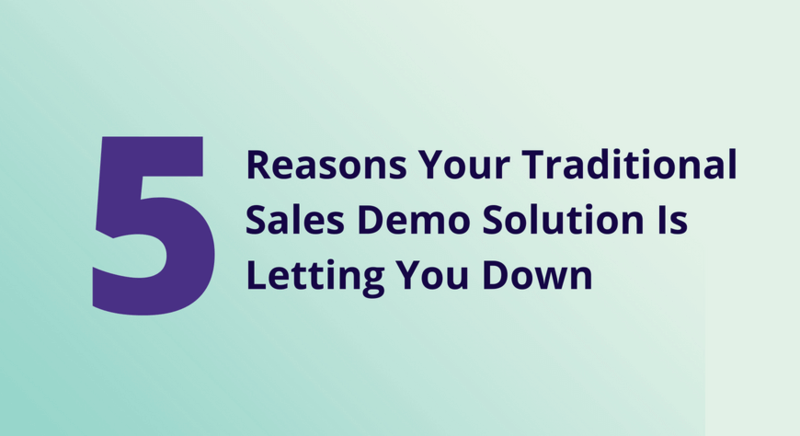 If your sales team controls the demo and there’s no option to leave it behind for prospects to experiment with, you’re missing an opportunity. Your sales team doesn’t gain insights into customer responses. The leave-behind demo can provide your team with valuable analytics about how prospects use your solution – or whether they use it at all. With a traditional demo/POC approach, you don’t have any visibility into the prospect’s side. So how can you avoid these constraints and give your sales team the best way to please modern buyers? Cloud-based demos provide the means to meet today’s higher level of expectations with quick and secure sharing of complex IT environments online. You are able to provide prospects with a dedicated, production-grade replica of your product, customized for the prospect’s existing IT environments for extended hands-on interactions. Prospect teams simply access the environment through a link; nothing to ship and nothing to configure. At CloudShare, we practice is what we preach. Contact us when you are ready. We’ll show you exactly what you’ll get and give you an opportunity for a hands-on POC*.